Atlanta, GA, October 12, 2018: When martial arts is the topic of conversation, people tend to gravitate to the east; Karate from Japan, Kung-Fu from China, or just maybe Jackie Chan, in recent times. 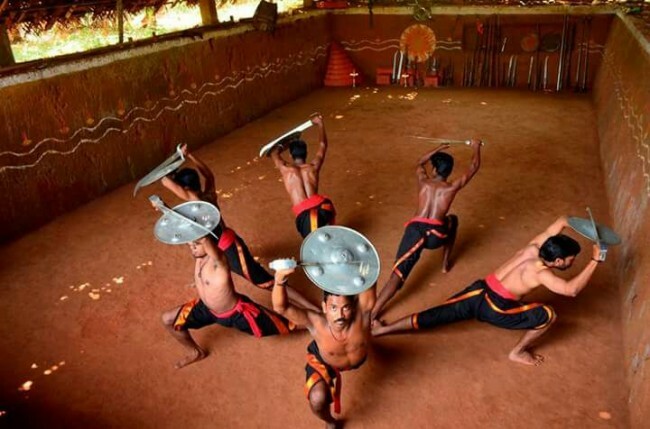 Not many are aware that Kalaripayattu (Kalari), one of the most ancient forms of martial arts with its history dating back to 3rd century BC, originated from God’s own country, Kerala, in India. Legend has it, that around the 5th century, Buddhist monk Bodhi Dharma took Kalari to the east where he taught the technique to Chinese monks. East Asian adaptations of Kalari led to the creation of the modern martial arts of Karate, Kung Fu, Judo etc. Atlanta’s Seema Jay, on a recent trip to India traced her immediate roots to the ancient art form and decided to be part of an effort to popularize the art form. Dr. C.P Satheesh, Seema’s cousin, a professor with a PhD in American sports fiction, with keen interest in Kalari, launched an Indian martial arts study, research and performance group with special emphasis on Kalarippayatt, named Kadathanad Kalari Vidya Peetamat Vadakara, in Kozhikkode District in Kerala. For this, he received a major research grant from the Indian Council of Historical Research (ICHR), New Delhi. Suresh Gurukkal, a renowned Kalarippayatt teacher, Prabhath Menon, a famous Kalari, Thai and Balineses masseur, an Ayurvedic doctor, a renowned yoga teacher and several expert gurus of other Indian martial arts like Silambam, Mardani Khel, Thang Tha etc. serve as associates at the organization. “Kalarippayatt is a combination of two Malayalam words Kalari—which means the arena for learning the martial art or a marked off dug space six to eight feet below the ground level. Payatt literally means a duel or fight with swords; metaphorically it signifies or encompasses all the exercise regimen and the martial techniques employed (including fight with staff, sword and spear),” explains Dr. Satheesh. SUBSCRIBE TO OUR VIDEO NEWS CHANNEL!! “Many attribute Chinese perfection of Kung Fu to a visiting South Indian Buddhist mendicant, Bodhidharma. A few other historians and scholars ascribe the rise of Kalarippayattu to the distinct Dravidian (South Indian) culture and tradition of combat and wars,” he adds. There are three distinct variants of this martial art. Southern Kalari, founded by Sage Agasthyar practiced in the southern districts of Kerala and the districts of Kanyakumari and Nagercoil in Tamil Nadu, Northern Kalari inducted by Sage Parasurama is believed to have originated in the North part of Kerala, especially in Kozhikkode, Wayanad, Malappuram and Kannur districts, Tulunadan Kalari, an almost extinct form, existed in the South Canara districts of Karnataka, such as Udupi, Kasaragod district of Kerala. 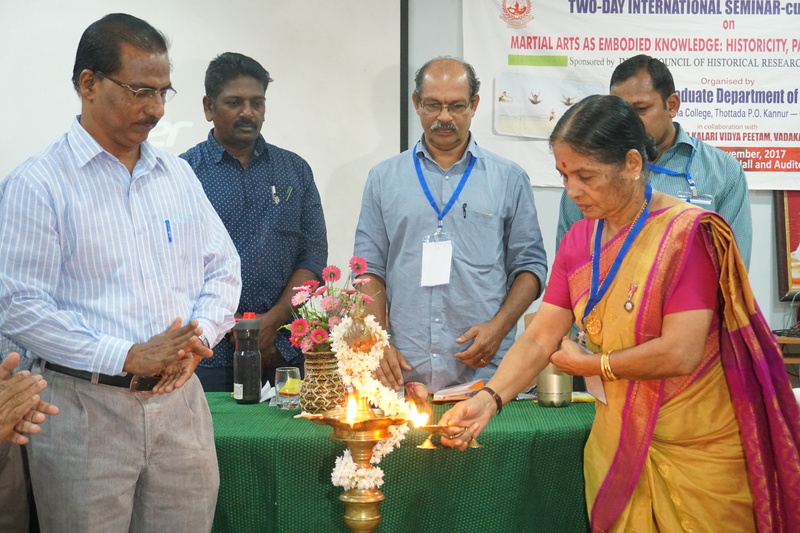 Dr. Satheesh and others at the inauguration of the international seminar on martial arts at his school. “It can be safely assumed with historical and anecdotal evidences that the culture and influence of Kalarippayatt extended from Gokarna to Kanyakumari, the southernmost tip of India and then to Kanchi near Chennai and without any doubt inSri Lankatoo,” Dr Satheesh says. The training is scientific and meticulous. It begins with the onset of South Western Monsoon in Kerala on June 1, and never conducted in summer months. It includes Meyppayatt or physical training- loosening exercises, flexibility enhancing body postures, Kolpayatt or combat techniques with a long or short staff, Angkathari or Ayudhappayatt that means battle with dagger, sword, club, spear and long curvy sword and Verumkai involves combat techniques without any staff or weapon, hands-free fighting techniques. “This is the highest degree that one can obtain in Kalari training. The Guru imparts lessons from fourth module only to those disciples he has confidence in and only to the most accomplished ones in the other three,” he adds. In the last module, Gurus tutor their wards the 108 vital spots in the body, mentioned in Ayurveda. This advanced stage of Kalari learning involves learning striking the opponent at the vital spots using certain deft and highly skilled combat techniques which is fatal to the receiver. “After completing this training, the learner reaches a certain level of spiritual and philosophical state wherein he or she will not be provoked into thoughtless retaliatory action, needless to say that he is expected to stay away from unwanted altercation where he can display his combat skills,” says Dr. Satheesh. Ideally it takes six years to master the art, since it only taught during the rainy season. Kalari massage and lessons on vital spots of human body serve as value-added modules of training. “The holistic treatment and therapeutic system of Kalari, especially that of sprains, dislocations and fractures is very effective. It has a well-defined, soothing massage system which is very popular with the natives and now catching on with the visitors to the state,” says Dr. Satheesh. “Indian martial arts in particular and Asian martial arts in general are body-mind disciplines which train the learner to be a philosopher-fighter rather than a street fighter,” he adds. "Insuring yourself through Visitor Coverage"
hello, this is Seema Vijayi from Atlanta, United States of America.